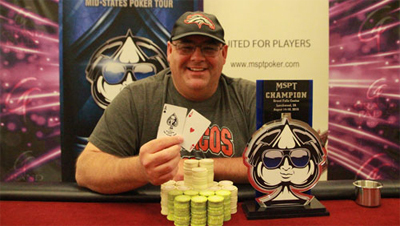 The Mid-States Poker Tour continued this weekend with a new stage of the season VI in Sioux Falls, Iowa. After two days of competition in the poker room of the sumptuous Grand Falls Casino & Resort, the victory came back to Alan Curl. He surpassed a field of 238 players to pocket the first prize of $ 64,655. 54 players made it through the first day, the Day 2 has as challenge the 27 paid places. All the competitors who will be paid were known when Larry Ormson fell at the 28th place in the level 19. After the bubble burst, Allan Curl continued to stack up the chips and take the lead of this poker event at 10 remaining players. Several players were thus eliminated before the constitution of the final table, it was the case of Aaron Johnson, Phil Mader, Matt Kirby, Lance Harris or Chuck Costanzo. Former MSPT champion Dan Hendrickson was the first eliminated from the final table for $ 4,617, followed by John Streese (8th, $ 6,925) and Ryan Skluzak (7th, $ 9,234). Short stack when six players remaining, Brian Davis was the next eliminated ($ 11,543) followed by Sam De Silva ($ 13,851) and Chris Burke ($ 17,776). The elimination of Kim Rasmussen in the 3rd place for $ 21,931 had allowed Alan Curl to face Jon Maras in the final heads-up. Jon Maras was unable to catch his delay face to Alan Curl and settled finally for the second place and winning at the same time $ 38,091.